One of my favorite treats each week is to stop into my favorite patisserie in Walla Walla and order a cup of decadent hot chocolate, or chocolat chaud as my Francophile-self is often inclined to call it. The drink itself is the dessert, the sweet treat, the simple luxury, that brings me calm and comfort no matter what has transpired throughout my day. Since each cup is more than four dollars, I wanted to see if I could recreate it myself at home, saving a few pennies in the process, but also potentially creating an opportunity to share this favorite treat with those who stop by for a visit if my new venture in the kitchen proved successful. And since you are reading this post, you already know the answer to my attempt. 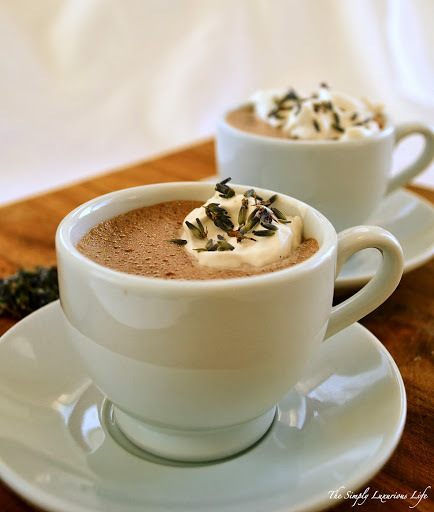 Having chocolate come out of my ears, I am giddy about today’s recipe – Simply Luxurious Chocolat Chaud. So delicious, your guests will assume you worked tirelessly and spent oodles of dollars to achieve such chocolate decadence, but the simplicity will encourage even the most novice of cooks to mix it up again and again. 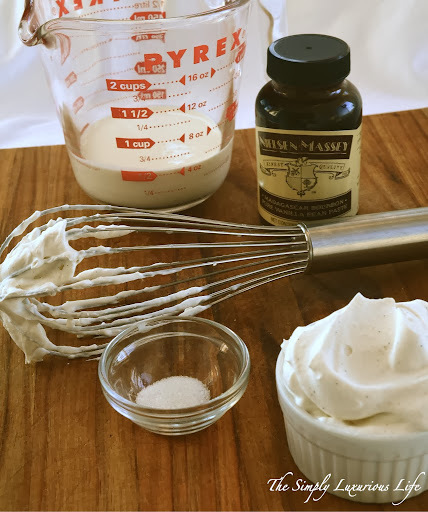 Make the whipping cream first. Mix the cream, sugar and vanilla until stiff peaks form. Refrigerate until ready to use. 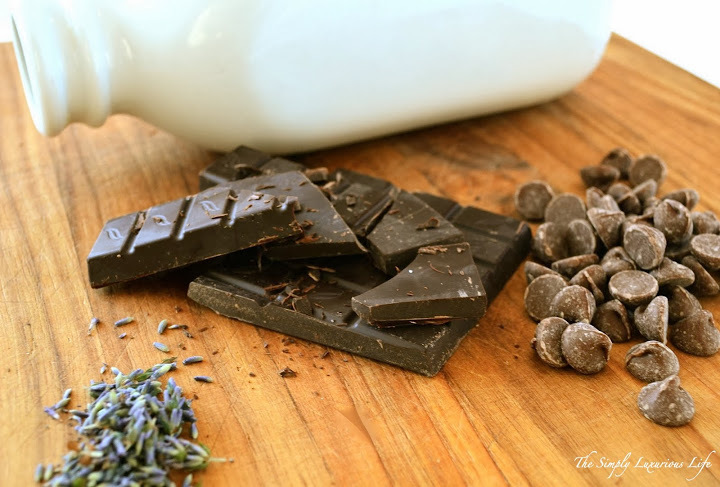 For chocolat chaud – Heat milk, heavy cream and lavender buds over low-medium heat in a sauce pan, stirring occasionally. Heat until milk/cream is warmed through and simmering (not boiling!!!). 3-5 minutes. 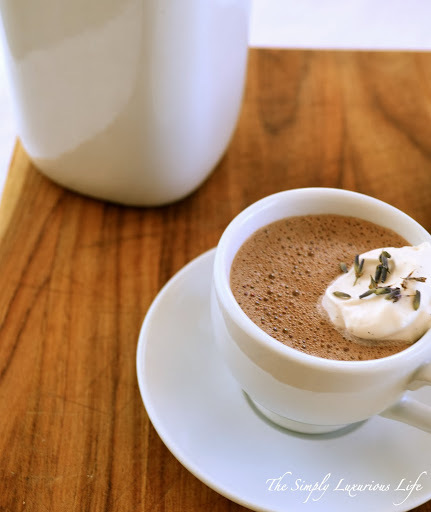 OPTIONAL – (If making lavender infused chocolat chaud). Remove from heat and let lavender steep for five minutes in the milk. Strain lavender buds from milk and return the milk to the saucepan and the stovetop. Over medium heat, add chocolate and sugar to the milk until chocolate is melted and incorporated. Whisk milk mixture until smooth. Pour into cups or bowls and place a dollop of whipped cream on top. Keep refrigerated and heat up on the stove when you want to enjoy. The long your simmer it on the stove, the thicker it will get. I have been making my own hot coca (a little different than hot chocolate) for years. I highly recommend Scharffen Berger’s 100% unsweetened cocoa, organic milk and organic cream. When you go this route, you can enjoy the health benefits of milk and cocoa and control how much sugar is in the cup! It looks really good! Love your blog! You have to try it! So simple. You’ll never return to powdered hot chocolates – never.